Got Craft is returning just in time for you to find some unique treasures and gift ideas. Details are in the flyer above and listed below. Happy shopping! When: Sunday, December 5th, 2010 from 10:00 a.m. to 5:00 p.m. Hands down, my favorite craft show to attend. 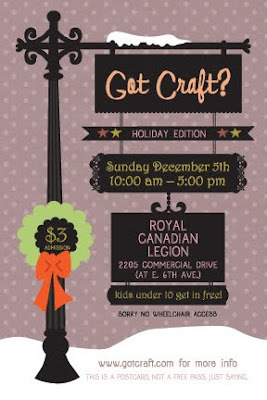 I hear that Spool of Thread sewing lounge will have a free DIY craft for attendees to try! wish I was closer, would love to visit! I attended one a few weeks ago and it was so much fun!